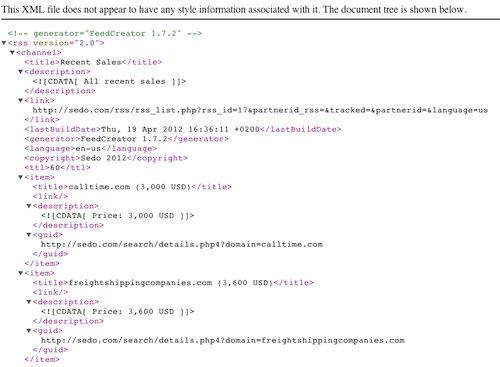 I don’t know about you, but viewing the raw Sedo sales rss feed is difficult on the eyes. It wasn’t really made to view in the feed form, but for someone without the technical skills to turn it into something else, the feed form was basically the best I could ask for without having to pay someone to convert it. Although I would prefer the feed to show more than 9 recent sales, that’s the maximum number of articles permitted with iGoogle. It should automatically update for you each time a sold name is added to the sales report. You can use p3k.org/rss to create a list of recent sales. No limit on the number of recent sales. Umm… Can you say google reader? I knew that you could. Nice… haven’t used Google Reader, and that seems to be an even better way to display the sales. 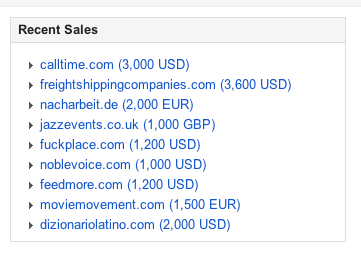 I love the 5th domain down from recent sales. Been to that restaurant. Best fish tacos in town. +1 for Google Reader. That’s how I keep up with Elliot’s Blog, too. I like Namebio.com for that information and other sales. Namebio is great at keeping sales data, but sometimes the information is more helpful if you have access to it immediately. http://sedo.com/rss/rss_list.php?rss_id=17 into an explorer browser it renders properly. I have problems logging into sedo on explorer, So use chrome for that and in the admin, but have to switch back to explorer to read RSS feeds. That is awsome! I didn’t know IE was a rss reader from the address bar. Sweet. I used to subscribe to the RSS feed in Google Reader. But be warned: every once int while the feed will throw up 500 old sales and clog up Reader. I just created a reader that grabs this feed and shows the last how many I want and it auto updates without refreshing the page via jquery. Nice and easy. I use Chrome and it doesn’t show nicely in this browser. If you want to see anything else let me know. Would be cool to either play sound if it updates or send an email when new listing comes into the feed. Nope… Don’t think I ever used it. Give Google reader a try. you might like it. You can connect to google reader on your ipad using RSS reader apps such as FeeddlerRSS. Many of us have directory type websites much like Dogwalker.com. What do you use for a signal that a years subscription is almost up and what then do you send the customer? I have a spreadsheet, but most are on auto-renew with Paypal. Those who aren’t, I send an email to at the end of the term to ask about renewing.